Take a ride on Harry Potter's flying broom -- race across the night skies to Hogwarts Academy, and relive the intrigue, magic and wonder of the first six Harry Potter stories… all on the wings of music. Enjoy the magical compositions of John Williams and Nicholas Hooper as they create a world filled with witches, wizards, warlocks… and muggles. Your host is a delightful old wizard, who guides you through Harry's thrilling years at Hogwarts Academy. You'll meet giant spiders; learn about potions and Quidditch; and you'll fly on a Nimbus 2000. Lighting and sound operators are also required, and a Stage Manager to call cues, and all must be present at rehearsals. 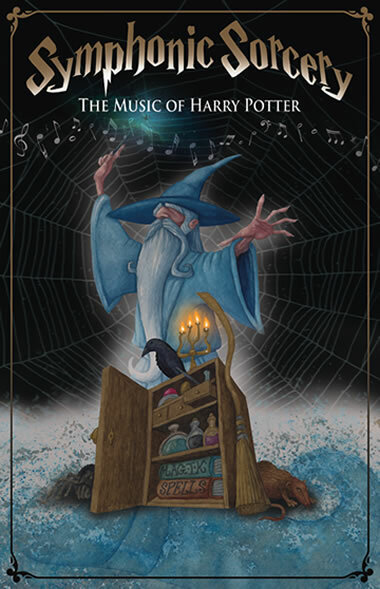 Symphonic Sorcery presents musical selections from the first six Harry Potter Films. The concert is narrated by a kindly old wizard. Details of each story are revealed, so each piece of music has a dramatic context.